Marie Daulne’s music reflects the story of her life. Her father, a Belgium colonialist, was killed by child rebels in the Democratic Republic of the Congo shortly after impregnating her mother, Cyrille Daulne. After his death Cyrille emigrated to Belgium, where Marie was schooled and raised. When she was 20, Marie returned to Africa to explore her Pygmy roots. Her exploration continued within her music. 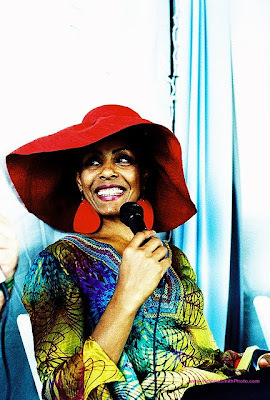 Most people know Marie Daulne as the lead singer of Zap Mama. With her music she connects her dual cultural past, hoping to create a universal, positive music to connect people. Her second album, Adventures in Afropea 1, was the best selling world music album in 1993, making her a leader in the genre of world music. I completely believed that I was going to go to the Olympic Games. I wanted to attend a higher level, but I broke my knees and that brought me down on earth. Sitting on my knees, I started reading, reading, reading. Then I discovered through writers the history of the world of the human being. This is when I started changing. Why am I running? I started running all over the world discovering different societies, and then I thought I had to learn from different societies the essence of enjoyment. I tried to catch what was the common funny things. I could go to the Pygmies living in the forest. What will be something fun that would make them laugh? Being in New York, San Francisco, what were the simple things that could make everyone laugh? I realized that it was falling. Falling in the floor. I remember walking with the Pygmies in the forest. When you’re in the forest the oxygen is so high that you’re high. I was completely high, like having two whiskeys. Suddenly there was a big branch and I fell and all the Pygmies laughing at me, this big tall lady. When I spend time with the Tuareg in the desert, I tried it again. I fell, and they started laughing. (Laughs) I have done it sometimes, but not on purpose. What happened that I’m making fun of myself? No. That’s (what she’s describing prior) stage diving. That’s what Erykah Badu told me to do. ‘Come on Mary jump! Fall in their arms. They’re going to fall in love.’ I did it. It was beautiful. Fall into their arms. Fall in love. Fall for peace. Fall for your beliefs. Just fall for us. These are a few wise words from Zap mama. Thanks for reading.